Today is the 40th edition of our periodic guest post series called 10 Questions. We have a list of 17 questions we pose to fellow financial bloggers, and they are free to pick and choose 10 or answer all of them. Let us know if you would like to be featured in a future edition of 10 Questions. Today’s post comes to us from Freedom 40 Plan. Freedom 40 is 37 and plans to retire at the tender age of 40. From what his net worth looks like, I think he has a pretty good shot! One thing that is awesome about the personal finance blogger community is how open many of us are about our finances. Growing up, my parents wouldn’t even tell me what their income was. The one time I asked, they yelled at me. Here in the blogger community, we have folks tracking their net worth for the world to see. I love it that Freedom 40 and others are doing this! Freedom40Plan.com is a blog focused on my own quest for financial independence by the age of 40. I’ve always been interested in money and personal finance topics, and setting a big hairy audacious goal (BHAG) like retirement at 40 seemed like a great way to keep me on track. I’m not sure if I’ll stop working at 40 or not, but I love the idea of being able to have the freedom to make the choices I want, and to do something like quit my safe, 9 to 5 job if that’s what I decide to do. The purpose of my blog in many ways is to hold me accountable to the goal I’ve set for myself. By remaining focused on the topic through my blog postings, I feel I’ll have a much better chance of success. I’d love to help out others in the community as well and hope that people are able to take something away from my perspectives and experiences. So far, I’ve really enjoyed posting and receiving feedback and comments from those who read the blog. I’ve always enjoyed writing since I was very young. However, in my everyday life, mostly all I do is write emails to work colleagues. Writing on a regular basis about topics I’m interested in for the blog has been a good activity and hobby for me. It’s helped me to remember the value I personally derive from writing and is getting me closer to another goal of writing a book someday. Freedom 40 is killing it! I think about this question somewhat often, but I think it is less a question of accomplishments for me and rather a question related to regrets. If I should be so lucky to live to 90, I don’t want to have any regrets. I want to be able to look back on my life and say that I did things the way I wanted to, rather than the way others do them or think they should be done. 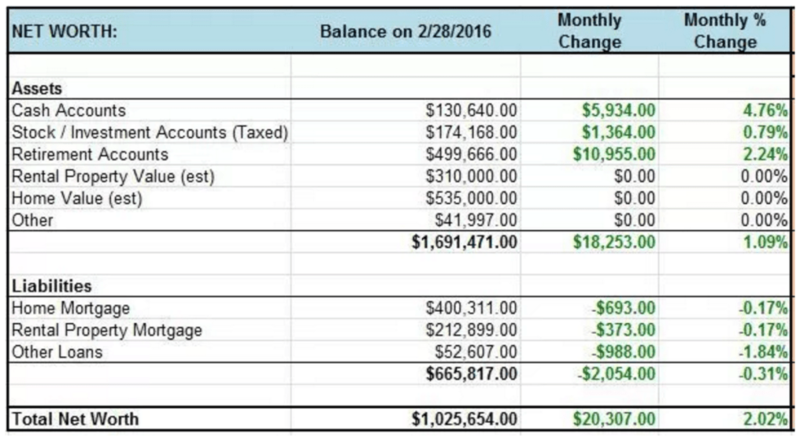 I think the basic concept of tracking your net worth on a monthly basis is the single most important and powerful tool I’ve come across. I think that clearly seeing how your assets and liabilities are moving and changing on a monthly basis can be incredibly powerful in driving behavioral changes. It’s all relative I guess. I never thought we were that poor when I was growing up. Certainly we had more than many others in my school. But looking back on it, I guess we were solidly middle class. It was always clear to me growing up that we were on a tight budget. We never really went out to eat, vacations typically involved tent camping at a nearby state park, and for the longest time my Mom drove a crappy old ford with over 100k miles on it. Mom always made a point of explaining money to me from an early age. She helped me open a bank account when I was 10 and when I wanted a new bike the deal was that she’d pay for half of it only. I had to save for months before I had enough to buy it. You better believe I valued that bike and took great care of it though! That’s just one of many examples I could give that are all basically the same. I guess that’s what turned me into such a saver and in being overall mindful of my money. I’ve rarely met a beer I don’t like, but one of my favorites around this time of year is Sea Dog Hazelnut Porter. I play basketball twice a week with a bunch of guys. Even though I’m not the best player, I love the game and it is great exercise. Beyond that I run from time to time but really need to do better about the consistency of my fitness regimen. Thanks Freedom 40 for your answers today! Be sure to stop in and say ‘Hi!’ to Mr. Freedom (I just made that up) over at his blog. Best of luck on your journey! Love this series 1500s. Thanks for introducing us to another interesting FIRE blogger. I’ll have to check out your site Freedom 40. Hope you have a great weekend! Mr. 1500 – Thanks for including me in this series! I continue to enjoy your blog and just hope I can offer some great insights like yours to the FI community! Freedom40 recently posted…Is this Rental Worth It? Love these posts…and getting introduced to finance bloggers I didn’t know before. Apologies for typo. Inexplicably. Damn auto correct.